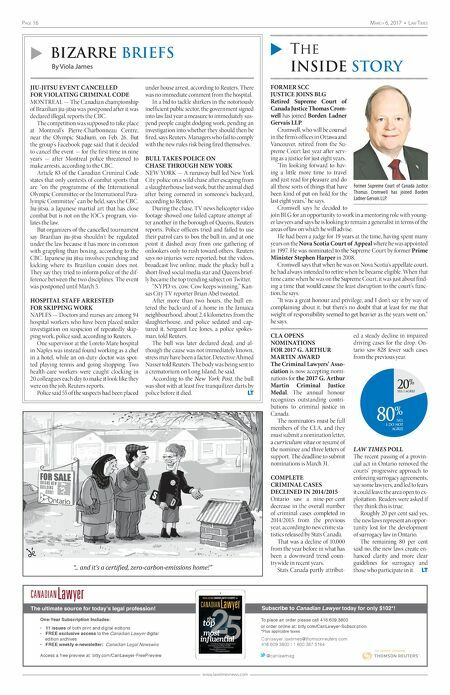 Page 16 March 6, 2017 • Law TiMes www.lawtimesnews.com One-Year Subscription Includes: • 11 issues of both print and digital editions • FREE exclusive access to the Canadian Lawyer digital edition archives • FREE weekly e-newsletter: Canadian Legal Newswire Access a free preview at: bitly.com/CanLawyer-FreePreview @canlawmag 7KHXOWLPDWHVRXUFHIRUWRGD\·VOHJDOSURIHVVLRQ Canlawyer.lawtimes@thomsonreuters.com 416.609.3800 I 1.800.387.5164 To place an order please call 416.609.3800 or order online at: bitly.com/CanLawyer-Subscription *Plus applicable taxes Subscribe to Canadian LawyerWRGD\IRURQO\ Untitled-5 1 2017-02-28 4:08 PM FORMER SCC JUSTICE JOINS BLG Retired Supreme Court of Canada Justice Thomas Crom- well has joined Borden Ladner Gervais LLP. Cromwell, who will be counsel in the firm's offices in Ottawa and Vancouver, retired from the Su- preme Court last year after serv- ing as a justice for just eight years. "I'm looking forward to hav- ing a little more time to travel and just read for pleasure and do all those sorts of things that have been kind of put on hold for the last eight years," he says. Cromwell says he decided to join BLG for an opportunity to work in a mentoring role with young- er lawyers and says he is looking to remain a generalist in terms of the areas of law on which he will advise. He had been a judge for 19 years at the time, having spent many years on the Nova Scotia Court of Appeal where he was appointed in 1997. He was nominated to the Supreme Court by former Prime Minister Stephen Harper in 2008. Cromwell says that when he was on Nova Scotia's appellate court, he had always intended to retire when he became eligible. When that time came when he was on the Supreme Court, it was just about find- ing a time that would cause the least disruption to the court's func- tion, he says. "It was a great honour and privilege, and I don't say it by way of complaining about it, but there's no doubt that at least for me that weight of responsibility seemed to get heavier as the years went on," he says. CLA OPENS NOMINATIONS FOR 2017 G. ARTHUR MARTIN AWARD The Criminal Lawyers' Asso- ciation is now accepting nomi- nations for the 2017 G. Arthur Martin Criminal Justice Medal. The annual honour recognizes outstanding contri- butions to criminal justice in Canada. The nominators must be full members of the CLA, and they must submit a nomination letter, a curriculum vitae or resumé of the nominee and three letters of support. The deadline to submit nominations is March 31. COMPLETE CRIMINAL CASES DECLINED IN 2014/2015 Ontario saw a nine-per-cent decrease in the overall number of criminal cases completed in 2014/2015 from the previous year, according to new crime sta- tistics released by Stats Canada. That was a decline of 10,000 from the year before in what has been a downward trend coun- trywide in recent years. Stats Canada partly attribut- ed a steady decline in impaired driving cases for the drop. On- tario saw 828 fewer such cases from the previous year. 80 % NO, I DO NOT AGREE YES, I AGREE 20 % LAW TIMES POLL The recent passing of a provin- cial act in Ontario removed the courts' progressive approach to enforcing surrogacy agreements, say some lawyers, and led to fears it could leave the area open to ex- ploitation. Readers were asked if they think this is true. Roughly 20 per cent said yes, the new laws represent an oppor- tunity lost for the development of surrogacy law in Ontario. The remaining 80 per cent said no, the new laws create en- hanced clarity and more clear guidelines for surrogacy and those who participate in it. LT u Bizarre Briefs By Viola James u The InsIde story JIU-JITSU EVENT CANCELLED FOR VIOLATING CRIMINAL CODE MONTREAL — The Canadian championship of Brazilian jiu-jitsu was postponed after it was declared illegal, reports the CBC. The competition was supposed to take place at Montreal's Pierre-Charbonneau Centre, near the Olympic Stadium, on Feb. 26. But the group's Facebook page said that it decided to cancel the event — for the first time in nine years — after Montreal police threatened to make arrests, according to the CBC. Article 83 of the Canadian Criminal Code states that only contests of combat sports that are "on the programme of the International Olympic Committee or the International Para- lympic Committee" can be held, says the CBC. Jiu-jitsu, a Japanese martial art that has close combat but is not on the IOC's program, vio- lates the law. But organizers of the cancelled tournament say Brazilian jiu-jitsu shouldn't be regulated under the law because it has more in common with grappling than boxing, according to the CBC. Japanese jiu jitsu involves punching and kicking where its Brazilian cousin does not. They say they tried to inform police of the dif- ference between the two disciplines. The event was postponed until March 5. HOSPITAL STAFF ARRESTED FOR SKIPPING WORK NAPLES — Doctors and nurses are among 94 hospital workers who have been placed under investigation on suspicion of repeatedly skip- ping work, police said, according to Reuters. One supervisor at the Loreto Mare hospital in Naples was instead found working as a chef in a hotel, while an on-duty doctor was spot- ted playing tennis and going shopping. Two health-care workers were caught clocking in 20 colleagues each day to make it look like they were on the job, Reuters reports. Police said 55 of the suspects had been placed under house arrest, according to Reuters. There was no immediate comment from the hospital. In a bid to tackle shirkers in the notoriously inefficient public sector, the government signed into law last year a measure to immediately sus- pend people caught dodging work, pending an investigation into whether they should then be fired, says Reuters. Managers who fail to comply with the new rules risk being fired themselves. BULL TAKES POLICE ON CHASE THROUGH NEW YORK NEW YORK — A runaway bull led New York City police on a wild chase after escaping from a slaughterhouse last week, but the animal died after being cornered in someone's backyard, according to Reuters. During the chase, TV news helicopter video footage showed one failed capture attempt af- ter another in the borough of Queens, Reuters reports. Police officers tried and failed to use their patrol cars to box the bull in, and at one point it dashed away from one gathering of onlookers only to rush toward others. Reuters says no injuries were reported, but the videos, broadcast live online, made the plucky bull a short-lived social media star and Queens brief- ly became the top trending subject on Twitter. "NYPD vs. cow. Cow keeps winning," Kan- sas City TV reporter Brian Abel tweeted. After more than two hours, the bull en- tered the backyard of a home in the Jamaica neighbourhood, about 2.4 kilometres from the slaughterhouse, and police sedated and cap- tured it, Sergeant Lee Jones, a police spokes- man, told Reuters. The bull was later declared dead, and al- though the cause was not immediately known, stress may have been a factor, Detective Ahmed Nasser told Reuters. The body was being sent to a crematorium on Long Island, he said. According to the New York Post, the bull was shot with at least five tranquilizer darts by police before it died. LT Former Supreme Court of Canada Justice Thomas Cromwell has joined Borden Ladner Gervais LLP. "... and it's a certified, zero-carbon-emissions home!"